UK Environment Secretary Michael Gove has declared war on crony capitalism. He won’t get any credit for this – not while we are (quite justifiably) hating on his dog’s vomit-pool of a government for its despicable failure in implementing Brexit. But he should because what he’s saying is important. Economic power has been concentrated in the hands of a few and crony capitalists have rigged the system in their favour and against the rest of us. Over recent decades, debt has fuelled growth in an unsustainable fashion – indeed growth has been built not just on irresponsible levels of borrowing but an unsustainable approach towards natural resources. ‘Our politics, culture and regulatory models have worked against innovation, indeed have been pushed in that direction by powerful incumbents. The problem dates back at least as far as the 2008 financial crisis. This was in part “solved” – or rather, the can was kicked down the road – using bank bailouts, ultra-low interest rates and quantitative easing (aka “money printing”; aka QE). While some of my finance-minded friends continue to swear there was no other way of averting even greater disaster, the side effects were scarcely less ugly than the problem being postponed. In the case of the financial sector, these consequences included: the hideous, overpaid irresponsible spivs who got us into that mess never being punished (indeed, in the case of people like Fred “the Shred” Goodwin, being rewarded with huge pay offs and massive pensions); the invention of the concept of “too big too fail”, whereby inept financial institutions which in a free market would be allowed to fold and be replaced by more robust replacements (“creative destruction”) were instead kept on life support by the taxpayer. So the City was propped up by ordinary people. And proceeded to show just how much it valued those ordinary people by voting overwhelming for Remain in the EU Referendum. In the case of the broader society, it exacerbated the divide between the haves and the have-nots. QE inflated the value of assets such as property and shares – making the wealthy (ie asset owners) richer, while making it harder for those who don’t already own property to get on the ladder. Hence the generational divide you often hear angry young Corbynistas grumbling about. Perhaps they would be voting Corbyn regardless – the young are drawn to demagogues’ promises of more free stuff because their frontal lobes haven’t formed and because their resolutely left-wing lecturers at “Uni” tell them it all makes sense. But it’s a pretty barn door size target for Occupy, Antifa and the rest, whenever they want to make the case that capitalism has failed: all they need do is invoke “too big to fail”, “fat cat bankers”, “generational injustice” and the rest. And what answer does the right have in response? Well if it hadn’t been for the drift the Conservative Party took under David Cameron and his almost unimaginably prattish Chancellor George Osborne, the right might have had an answer. But Dave and George didn’t want to be right. They just wanted to do whatever would get them off the hook till it was time to retire to their £500,000 a gig speaking tours and their one-day-a-week, £650,000 jobs working for BlackRock in between “editing” (lol) the Evening Standard and campaigning to undermine Brexit. What that meant, in other words, was embracing too-big-to-fail, money-printing, low-interest, Davos-Man, Vampire-Squid crony capitalism just like their Labour government predecessors had. This was the point of George Osborne’s appointment of Canadian ex-Goldman Sachser Mark Carney as governor of the Bank of England: business as usual for the global crony-capitalist elite; screw you, ordinary folk. Hence the revolutionary nature of Gove’s speech. It is a rejection of pretty much everything his party, most of his fellow cabinet members, and most especially his Chancellor and Prime Minister stand for economically. It exposes for the utter mendacity of that speech Theresa May when she became prime minister, about wanting to heal the “burning injustice” and make life easier for the “just about managing.” All right, maybe she wasn’t lying exactly. More likely she was simply too thick to understand it. But the point is this: right now, Conservative government economic policy is doing EXACTLY what socialists are always blaming conservatives for doing – favouring the rich at the expense of the poor. Someone senior in the government badly needed to point this out. How, after all, is capitalism ever going to stop getting a bad rap if the only version ordinary people ever get to see of it is crony capitalism? 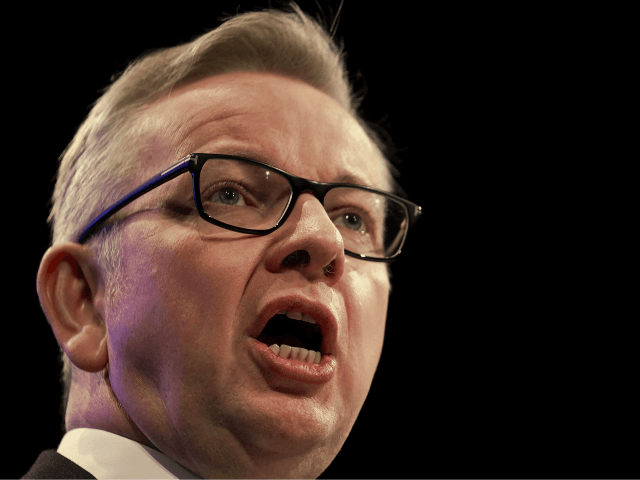 Gove, much as I love him, still isn’t my first choice to get the nation out of this mess – that would be Jacob Rees-Mogg, obviously. But what he has said in that speech is brave and important and a sign of hope that not everyone within this government is entirely useless. For which relief, much thanks.